The tweet from Jeffrey P. Bezos, announcing his stunning blog post, came Thursday at 5:51 p.m East Coast time. And for a few long minutes, the chattering classes shut up. And read. And tried to make sense of what they were reading. Yes, it’s official. We are living inside a Tom Wolfe novel – call it “Bonfire of the Insanities” – set in the furiously bubbling political and media cauldron of 2019. At the center of the unreality is the supermarket tabloid National Enquirer, which for many years walked the line between sleaze and a kind of tawdry-but-scrappy journalism – and which President Donald Trump repeatedly claimed, apparently in all seriousness, deserved to win the Pulitzer Prize. But in the past year or so, the depth of the Enquirer’s unethical business practices has been revealed. The publication, through its parent company, American Media Inc. or AMI – would “catch and kill” stories: buying damaging information only to bury it, never to be published. It paid hush money to protect Trump from claims of extramarital affairs. It had a clear political agenda and, through chairman David Pecker, a direct tie to the developer-turned-president. That all imploded last summer as federal prosecutors gave Pecker legal immunity in exchange for his cooperation in their investigation of Trump’s former lawyer and fixer, Michael Cohen. 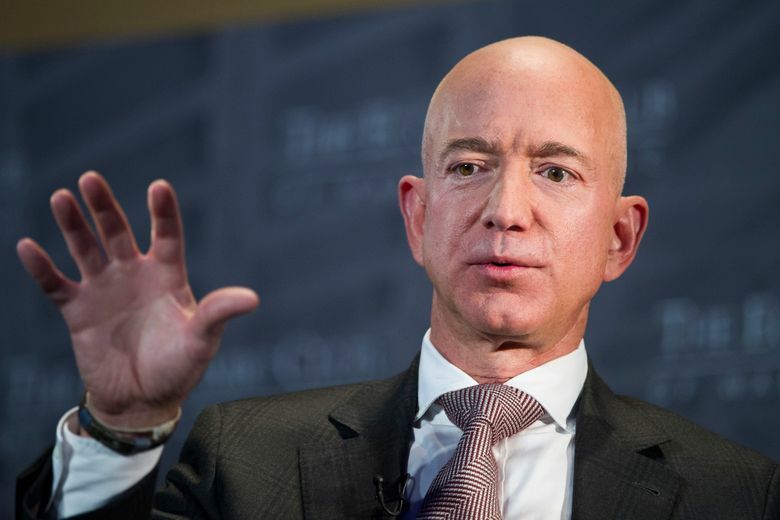 “Jeff Bezos just broke the National Enquirer’s business model,” tweeted Washington Post political columnist Karen Tumulty. Ronan Farrow, who won a Pulitzer Prize last year for his reporting on Harvey Weinstein’s sexual abuse, said that he, too, had been threatened by AMI during his reporting on the Enquirer’s practices. Ted Bridis, the former head of the Associated Press’s investigations team, said he’d heard threats that the Enquirer was looking into the background of AP staffers doing similar reporting. As Bezos put it in his blog post, he wouldn’t be blackmailed over threats to publish a “below the belt selfie,” or accede to AMI’s demand that he explicitly state that the publisher had no political agenda in publishing its investigation of his extramarital affair last month. “I prefer to stand up, roll this log over, and see what crawls out,” he wrote. Whether the revelations about AMI’s extortion efforts amount to criminality – the kind of criminality that could put Pecker’s immunity agreement in jeopardy – isn’t clear at the moment. AMI said Friday it “fervently” believes it was acting lawfully and in good faith with Bezos, but that its board will take another look. It’s also not clear what role, if any, Trump or his allies had in any of this. All of that is murky, and the swirling speculation is nothing more than that at the moment, though Trump has continually disparaged Bezos as the founder of Amazon and the owner of The Post. Those dots can’t be connected yet, and maybe never will be. But what is clear are the Enquirer’s true colors. This isn’t any kind of journalism, not even the diciest variety of supermarket tabloidism. Call it by its name: This is publication – or the threat of publication – as bludgeon. Whatever disappearing claim the Enquirer and AMI had to something more lofty has been steadily leaving the building. Now it’s official and irrevocable. By calling their bluff in a blog post, Jeff Bezos just kicked the door shut.